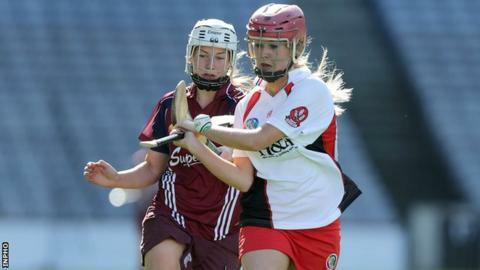 Derry camogs must replay the All-Ireland Intermediate final after a 3-12 to 3-12 draw against Galway on Sunday. Eilis McChaiside's goal helped Derry lead by six but while Katie McAnenly scored a second Derry goal, Galway trailed only 2-8 to 2-6 at half-time. Deirdre Burke's goal helped Galway lead but McAnenly's brave penalty appeared to have snatched victory for Derry before Rachel Monaghan's late leveller. Down were beaten 1-11 to 1-9 by Meath in the junior decider at Croke Park. Derry looked set for victory in the intermediate final as Ni Chaiside's soft early goal helped them take a six-point lead. Galway keeper Roisin Callanan totally misjudged Ni Chaiside's long-range shot as the ball floated into the net. However, Galway cut the margin to three in the 24th minutes as Maria Brehony blasted to the net but Derry responded in kind as McAnenly stroked in her first goal. The ebb and flow continued before the break as Tina Cormican's three-pointer helped cut Derry's interval lead to two points. Derry got a slice of luck after the restart as Grainne McNicholl's clear wide was waved a point by the umpire. The score helped Derry move four ahead but the game was back in the mix on 42 minutes as Deirdre Burke netted. Galway began to dominate possession but failed to convert a number of chances which would have put the game out of site. The Tribes women still appeared to have done enough as they led by two at the start of injury-time but amazingly, Derry were ahead again as McAnenly held her nerve admirably to fire a penalty to the net. The penalty came after Karen Kielt had scrambled the ball to the net but the referee had already blown up for a foul on the Derry forward. However, a Derry would have been an injustice on the Galway girls and Monaghan won a free in the final minute of injury-time which she pointed from 25 metres.